Messier 61 (M61) is a barred spiral galaxy located in the southern constellation Virgo. M61 can be found in the southern portion of the Virgo Cluster. It occupies an area of 6 arc minutes, corresponding to a spatial diameter of about 100,000 light years. The galaxy has an apparent magnitude of 10.18 and lies at a distance of 52.5 million light years from Earth. It has the designation NGC 4303 in the New General Catalogue. The best time of year to observe M61 is during the spring. Messier 61 lies just above the line between Auva (Minelauva), Delta Virginis, to Zavijava, Beta Virginis. It can be seen 8 degrees to the northwest of Porrima, Gamma Virginis, and only 1.25 degrees to the north-northeast of 16 Virginis. The galaxy can also be found along the line from Spica, the brightest star in Virgo, to Denebola, the third brightest star in the neighbouring constellation Leo. Small telescopes show M61 as a faint oval-shaped patch with a bright core, while medium-sized and large telescopes reveal a very clear nucleus and a hint of the galaxy’s spiral arms. The spiral arms and details of the galaxy’s structure become much clearer in 10-inch and 12-inch telescopes. This new Hubble picture is the sharpest ever image of the core of spiral galaxy Messier 61. Taken using the High Resolution Channel of Hubble’s Advanced Camera for Surveys, the central part of the galaxy is shown in striking detail. Also known as NGC 4303, this galaxy is roughly 100 000 light-years across, comparable in size to our galaxy, the Milky Way. Both Messier 61 and our home galaxy belong to a group of galaxies known as the Virgo Supercluster in the constellation of Virgo (The Virgin) — a group of galaxy clusters containing up to 2000 spiral and elliptical galaxies in total. Messier 61 is a type of galaxy known as a starburst galaxy. Starburst galaxies experience an incredibly high rate of star formation, hungrily using up their reservoir of gas in a very short period of time (in astronomical terms). But this is not the only activity going on within the galaxy; deep at its heart there is thought to be a supermassive black hole that is violently spewing out radiation. Messier 61 is one of the largest galaxies in the Virgo Cluster, a massive group of galaxies containing more than 1,300 members, found in the constellation Virgo. 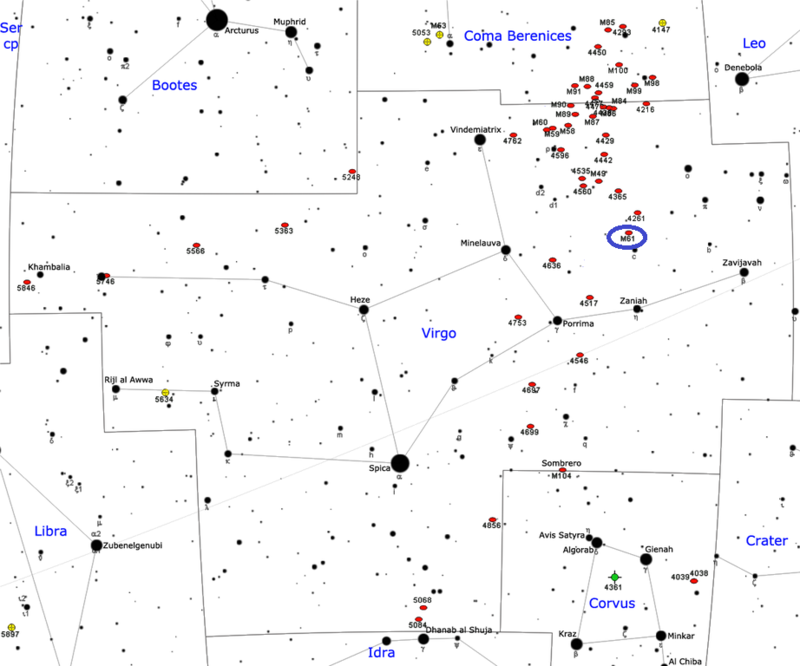 M61 belongs to a subunit of the cluster known as the S Cloud. With a diameter of about 100,000 light years, M61 is roughly the same size as our galaxy, the Milky Way. 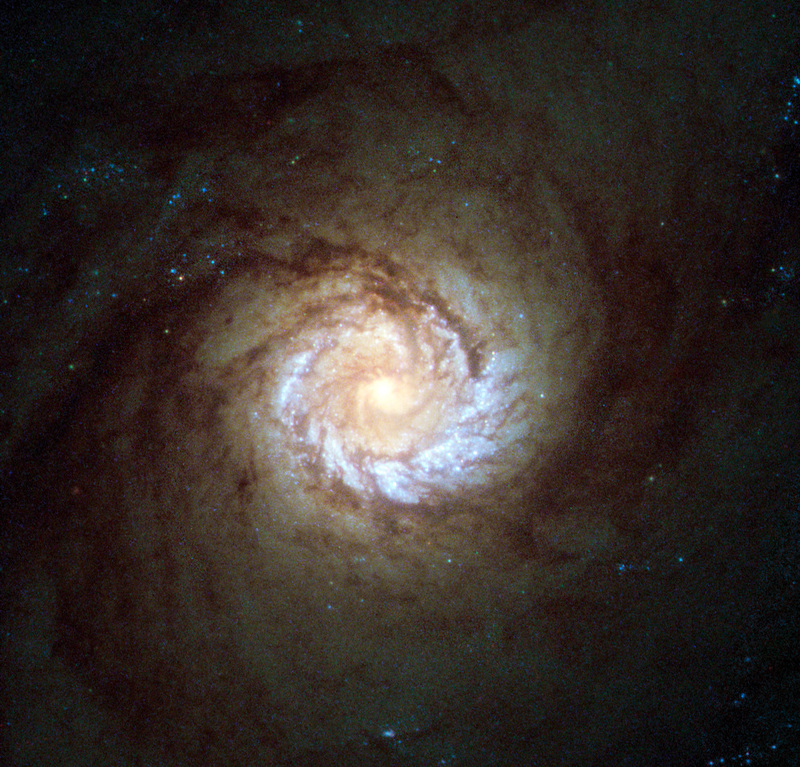 Messier 61 is classified as a starburst galaxy, one undergoing an extremely high rate of star forming activity. The galaxy has an active galactic nucleus (AGN) and a candidate supermassive black hole with an estimated mass of about 5 million solar masses. A young, compact massive star cluster associated with the object occupies an area with a radius of 3.1 parsecs. The cluster has a mass about 100,000 times solar and is surrounded by a nuclear spiral about 225 parsecs in radius, consisting of multiple massive star-forming regions, possibly associated with a second bar within the galaxy, one considerably smaller than the main one. 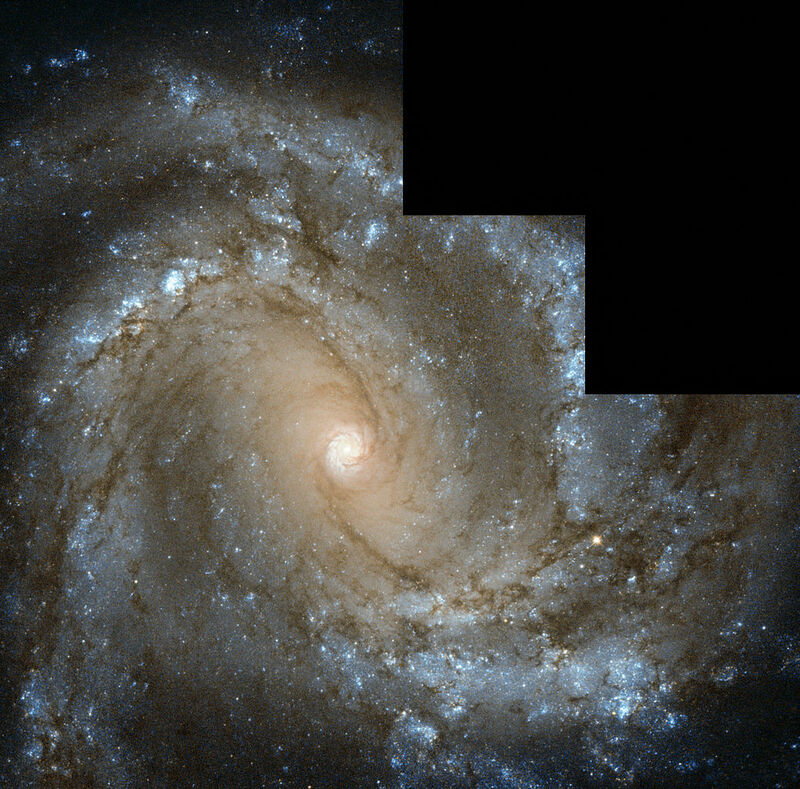 The NASA/ESA Hubble Space Telescope has captured this image of nearby spiral galaxy Messier 61, also known as NGC 4303. The galaxy, located only 55 million light-years away from Earth, is roughly the size of the Milky Way, with a diameter of around 100 000 light-years. 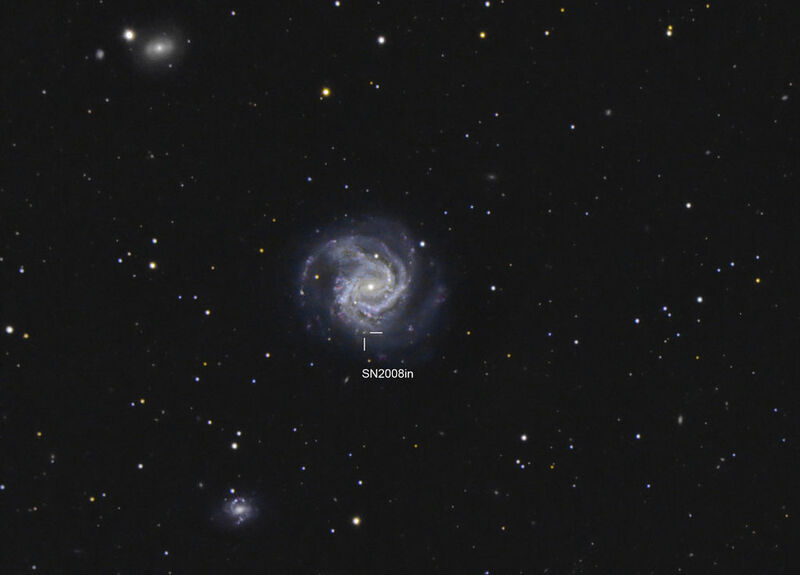 The galaxy is notable for one particular reason — six supernovae have been observed within Messier 61, a total that places it in the top handful of galaxies alongside Messier 83, also with six, and NGC 6946, with a grand total of nine observed supernovae. In this Hubble image the galaxy is seen face-on as if posing for a photograph, allowing us to study its structure closely. The spiral arms can be seen in stunning detail, swirling inwards to the very centre of the galaxy, where they form a smaller, intensely bright spiral. In the outer regions, these vast arms are sprinkled with bright blue regions where new stars are being formed from hot, dense clouds of gas. Messier 61 is part of the Virgo Galaxy Cluster, a massive group of galaxies in the constellation of Virgo (the Virgin). Galaxy clusters, or groups of galaxies, are among the biggest structures in the Universe to be held together by gravity alone. The Virgo Cluster contains more than 1300 galaxies and forms the central region of the Local Supercluster, an even bigger gathering of galaxies. Image: ESA/Hubble & NASA Acknowledgements: G. Chapdelaine, L. Limatola, and R. Gendler. 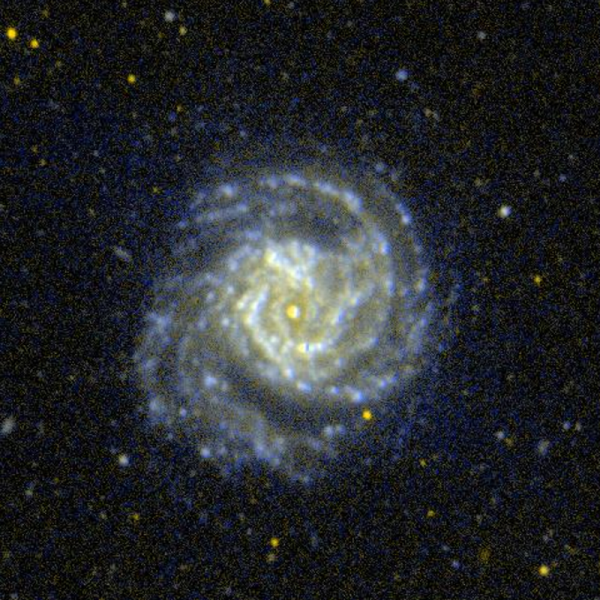 Messier 61 does not exhibit a deficiency of neutral hydrogen, unlike many late-type (spiral and irregular) galaxies in the Virgo Cluster. In fact, it is very rich in gas, which is unusual for a galaxy that is part of a dense cluster because most such galaxies have had their gas stripped away. The disk of M61 is also experiencing high levels of star formation, possibly as a result of the galaxy’s interactions with the satellite galaxies NGC 4292 and NGC 4303B. Seven supernovae have been detected in M61 in the last century, making M61 the current record holder among Messier galaxies: SN 2014dt (magnitude +13.2) in 2014, SN 2008in (+14.3) in 2008, SN 2006ov (+14.8) in 2006, SN 1999gn (+13.4) in 1999, SN 1964F (+12) in 1964, SN 1961I (+13) in 1961, and SN 1926A (+12.8) in 1926. The most recent supernova, SN 2014dt, was classified as type Ia-pec, while the previous three – SN 1999gn, SN 2006ov, and SN 2008in – were found to be type II. Nebula, very faint & difficult to perceive. M. Messier mistook this nebula for the Comet of 1779, on the 5th, 6th & 11th of May; on the 11th he recognized that this was not the Comet, but a nebula which was located on its path & in the same point [place] of the sky. A large pale-white nebula, between the Virgo‘s shoulders. This is a well defined object, but so feeble as to excite surprise that Messier detected it with his 3 1/2 foot telescope in 1779. Under the best action of my instrument it blazes towards the middle; but in H. [John Herschel]’s reflector it is faintly seen to be bicentral [an illusion caused by the bar], the nuclei 90″ apart, and lying sp [south preceding, SW] and nf [north following, NE]. It is preceded by four telescopic stars, and followed by another. Differentiated with the following object [17 Virginis], from which it bears about south by west, and is within a degree’s distance. This object is an outlier of a vast mass of discrete but neighbouring nebulae, the spherical forms of which are indicative of compression. 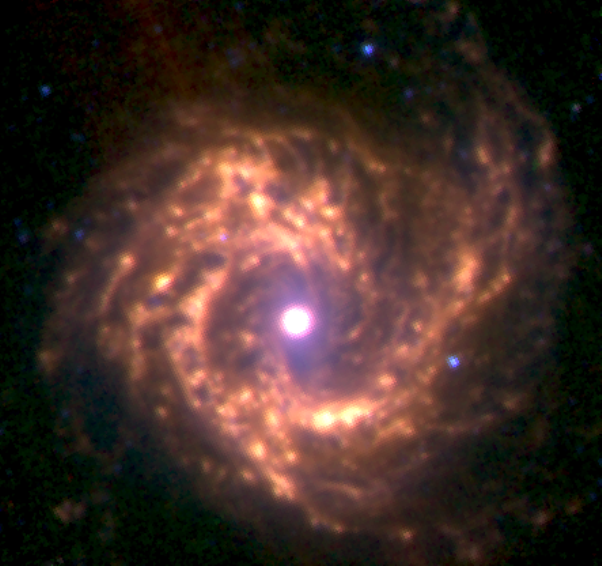 Image of the M61 galaxy in infrared at 3.6 (blue), 5.8 (green) and 8.0 µm. The image has been made by Médéric Boquien from the public image archive of the Spitzer Space Telescope (courtesy NASA/JPL-Caltech).